MeteoFax32: RadioFax, Rtty, Sitor, Navtex high performances modem. This modem has been designed for quality decoding even with poor radio propagation conditions. Tested worldwide on all types of boats, this modem has proven itself even in areas where reception is made difficult by the remoteness of stations as in the Indian Ocean where all other equipment show their limits. This modem provides analog (see analog filter) then digital filtering as well as signal processing by a powerful processor that will process the signal and ensure communication with the software. This provides optimal performance even with a handheld receiver. Only an accurate and sensitive modem specifically designed for this type of signal ensures global coverage at sea. 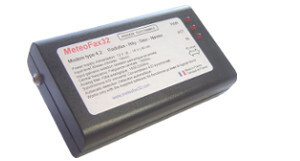 This modem is used to decode the Radiofax or Weatherfax, Rtty, Sitor and Navtex modes. - Spectral analysis of the signal. - Level input (BF) signal. - Instantaneous frequency of the signal. - Rejection rate of out of band below signals by digital filtering. - Rejection rate of out of band high signals by digital filtering. - Shift of the received signal (width modulation). - Tuning of the receiver on the signal. - Noise level of the signal. - Filling rate of the buffer. - USB or RS232 socket. - Headphone output or external loudspeaker output. - 12 volts (9 to 16 volts) 40 mA.